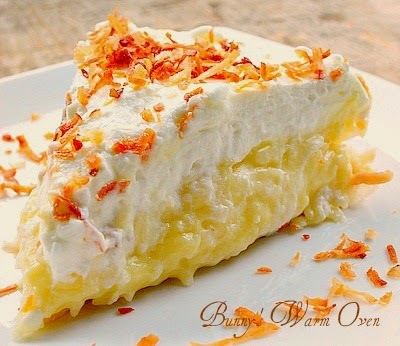 Bunny's Warm Oven: The Best Homemade Coconut Cream Pie You'll Ever Eat. The Best Homemade Coconut Cream Pie You'll Ever Eat. This pie is absolute coconut heaven. It's the best coconut cream pie that will ever cross your lips , PERIOD. Why did I decide on this recipe? There was coconut milk and shredded coconut in the filling, and toasted coconut on the pie. And...whipped cream for a topping. The whipped cream was the clencher for me. I made the pies and took them over to our neighbor the night before the 4th. We were also invited to the party, but didn't get there till ...all but 2 slices let of two pies later. Everyone LOVED it! They praised this pie as the best pie they ever ate. I was able to salvage a sliver to taste it. That wasn't enough, I needed my OWN. Even in this heat I wanted to make this pie! Instead of buying half and half and whipping cream I made my own half and half with milk and whipping cream. I made 2 cups of half and half by combining 1 1/2 cups milk with 1/2 cup of cream. Then I measured out the 1 1/2 cups of half and half I needed and saved the extra 1/2 cup for coffee or tea. It worked perfectly. I also toasted my coconut until it was a golden brown, I wanted the pie to have another small layer of coconut flavor slightly different than the creamy layer of coconut. I refrigerated my filling longer than 40 minutes. It was about 2 hrs before I put the whipped cream on it. This pie is absolute coconut cream pie perfection. It starts with the first bite, light and creamy with a wonderful coconut flavor, thanks to the coconut milk. It's very very more-ish. You don't have to look any farther than this recipe for the Best Homemade Coconut Cream Pie EVER! Enjoy! At the request of Robyn Stone the creator of this recipe , I am redirecting you to Add A Pinch to see the recipe. Need another WOW recipe for pie? Try this SPECTACULAR No Bake Berry Cheesecake! Well, I believe you! I made a coconut cream pie and never blogged it. It tasted good, but the filling never set up. I was bummed. As soon as I can stand up long enough to bake, again, I'm making this pie-- and I'll let you know. Sounds fantastic! coconut cream pie is one of my all-time favorites, and this one sounds terrific. i'm so glad you took the whipped cream route instead of meringue--what a way to spoil a delicious pie! Can you believe I have never made or even tried coconut cream pie? This is definitely going on my to bake list, it looks incredible. Thank you for the review anonymous! It truly is, the perfect coconut cream pie! I just made this pie last night. It really is yummy! I used a different recipe for the crust though (the one I used included coconut in the crust- SO DELICIOUS!!! My boyfriend LOVED the crust!). As for the filling, the only thing I'm going to change next time is to pulse the coconut in a food processor before adding it to the custard because it was a little too "stringy." Overall this was great for my first attempt!!! Anonymous I'm so glad you made it and loved it! Coconut in the pie crust! What a great idea!! Thanks for letting me know about the crust. If you go to the recipe index and look under pies, you see the picture of this pie but there's no link to the recipe. Anonymous, in the post it's self I have linked up to Add A Pinch blog, that's where the recipe is. Beautiful pie Mary! And as always, your photography is stunning! Thank you for sharing it!